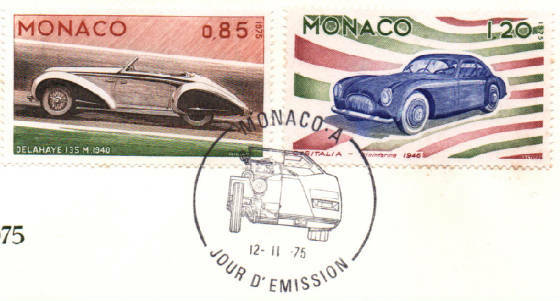 Monaco is a beautiful country on the southern coast of France and borders the Mediterranean Sea. It's only 481 acres in size and has a population of about 39 thousand citizens. 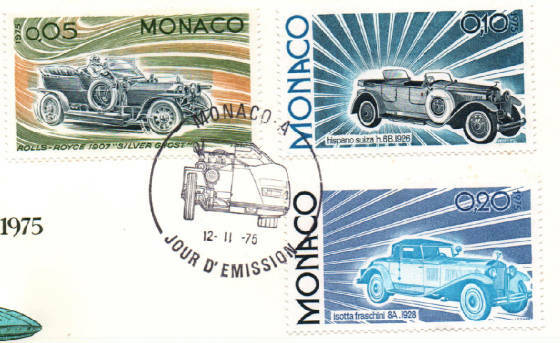 On November 12, 1975 the Monaco postal service issued a set of eleven stamps commemorating and recognizing the development of the automobile from the years 1900 through 1975..
Scott #'s 980 through 990 depict some of the most exotic and remarkable automobiles ever produced. 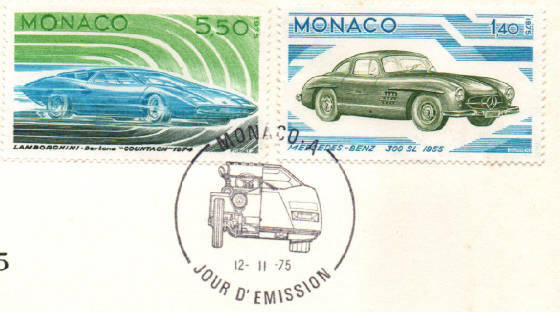 For those of you who collect cars on stamps, a complete set of these first day covers is scarce. 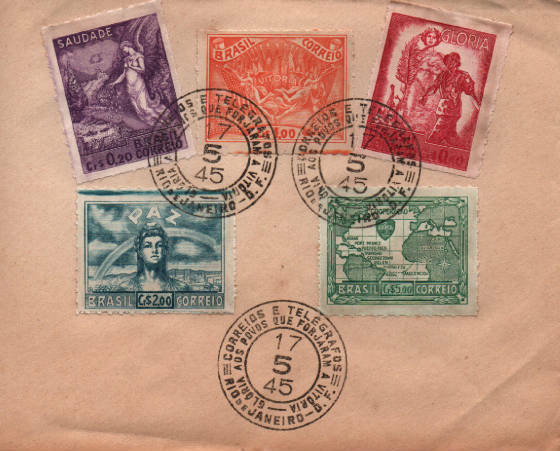 On May 17, 1945 the Brazilian postal service cancelled this commemorative cover honoring the victory of the allied nations in Europe. 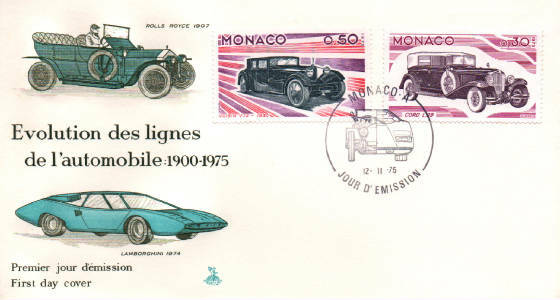 Scott #'s 628 through 632 adorn this beautiful souvenir cover withe the special circular date stamped cancels. 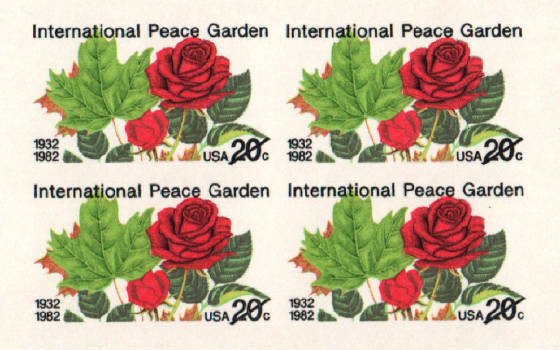 The stamps in order, by Scott number, represent Tranquility, Glory, Victory, Peace and Cooperation. 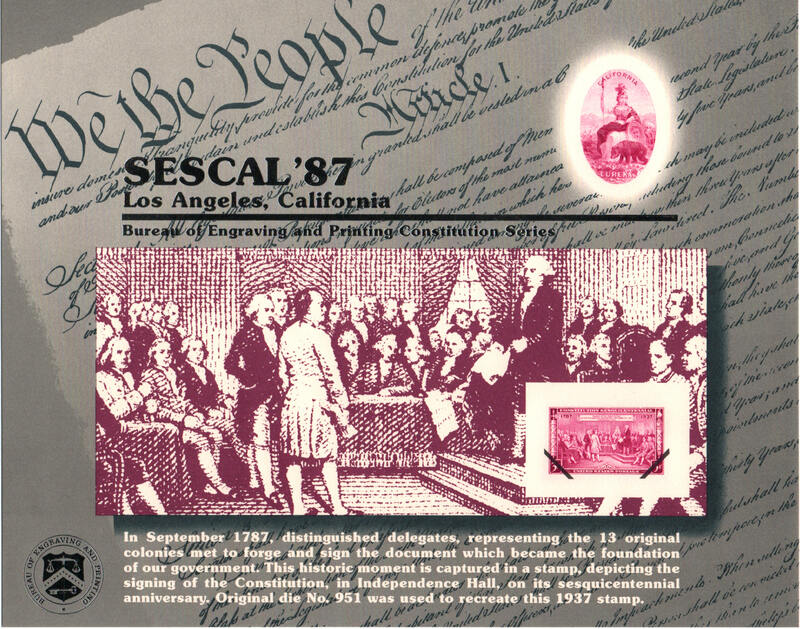 Sescal '87 Los Angeles, the Stamp Exhibition of Southern California, was held on the 200th anniversary of the signing of the Constitution of the United States. This fine Bureau of Engraving and Printing souvenir card illustrates that historic day when, on September 17, 1787, the delegates representing the 13 original colonies gathered to sign the Constitution. 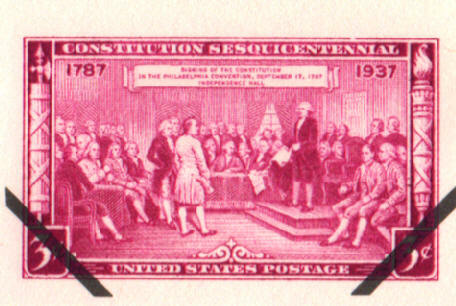 The stamp, Scott #798, the Sesquecentennial Issue commemorating the 150th anniversary of the signing of the Constitution, was issued on September 17, 1937. The Great Seal of the State of California was adopted at the California state Constitutional Convention of 1849 and has had few changes since then. 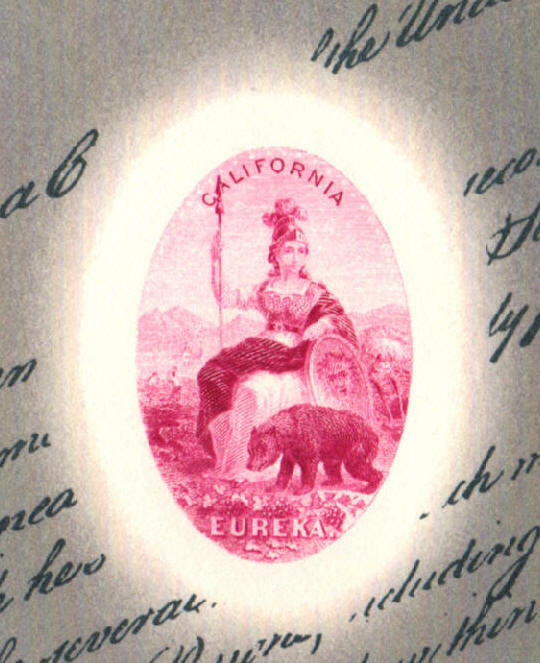 The seal features the Roman goddess Minerva (Athena in Greek mythology), the goddess of wisdom and war; a California grizzly bear (the official state animal) eating grape vines; a sheaf of grain that represents agriculture; a miner, representing the California Gold Rush and the mining industry; and sailing ships that represent the state's economic power. The word Eureka (εύρηκα in Greek), means "I have found it" and is the California state motto. In many ways, you'll find reward. 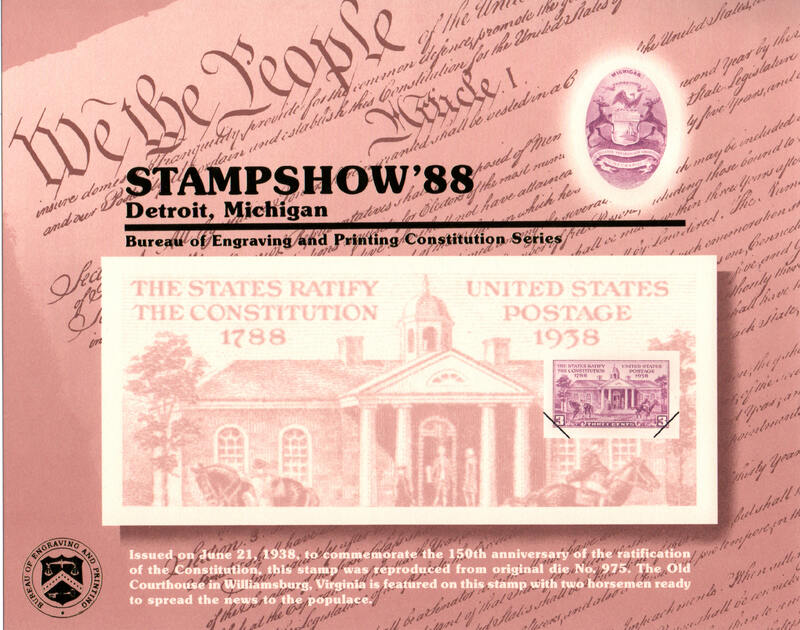 In a ceremony held at Stampshow '88 in Detroit, Michigan, the Bureau of Engraving and Printing issued this fantastic souvenir card commemorating the ratification of the United States Constitution. The Constitution Ratification Issue was released on June 21, 1938 commemorating the 150 anniversary of the ratification of the Constitution. 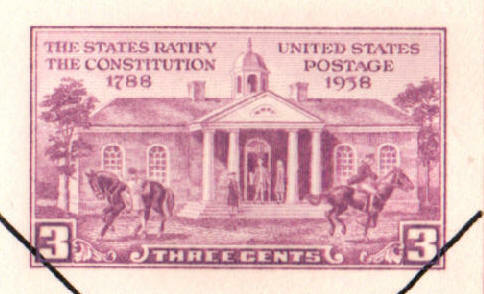 The stamp illustration, Scott #835, features the Old Courthouse of Williamsburg, Virginia. 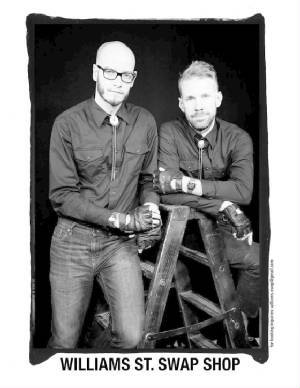 Notice the two horsemen ready to deliver the good news to their countrymen. 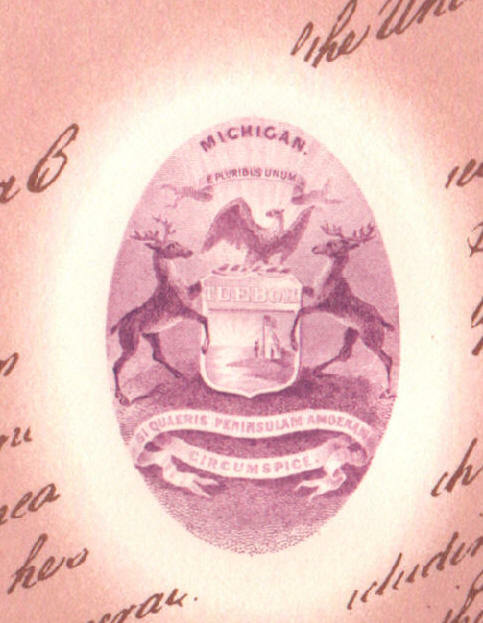 The Great Seal of the State of Michigan includes the latin word "TUEBOR" which means "I Will Defend". Souvenir cards are just plain great ! They can be great investments, too ! Beginning in 1960 the United States Post Office Department, now the United States Postal service, began printing "official souvenir cards". The Bureau of Engraving and Printing started producing souvenir cards in 1969. In 1972 the United Nations Postal Administration began this practice as well. 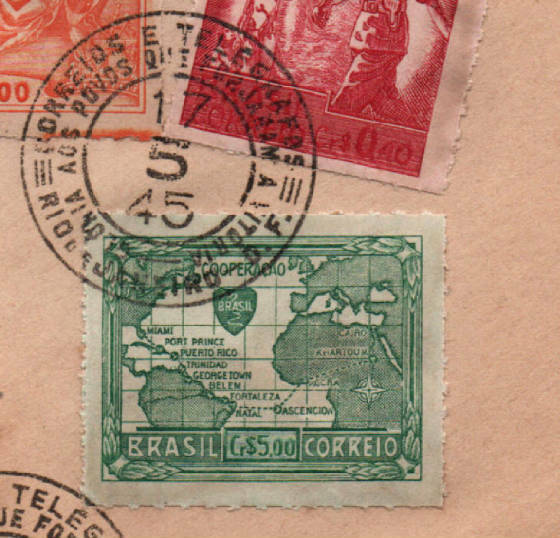 These are the only official producers of what are now known as nonpostal, highly collectible, cardboard souvenirs of stamps and stamp collecting. Some quite rare and valuable. 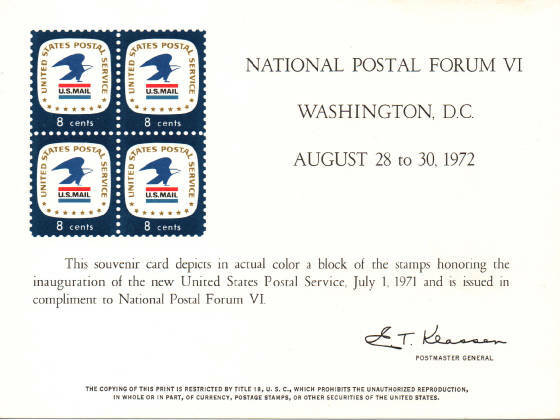 This souvenir card was printed by the United States Postal Service for the National Postal Forum VI held in Washington D.C. August 28 to 30, 1972. 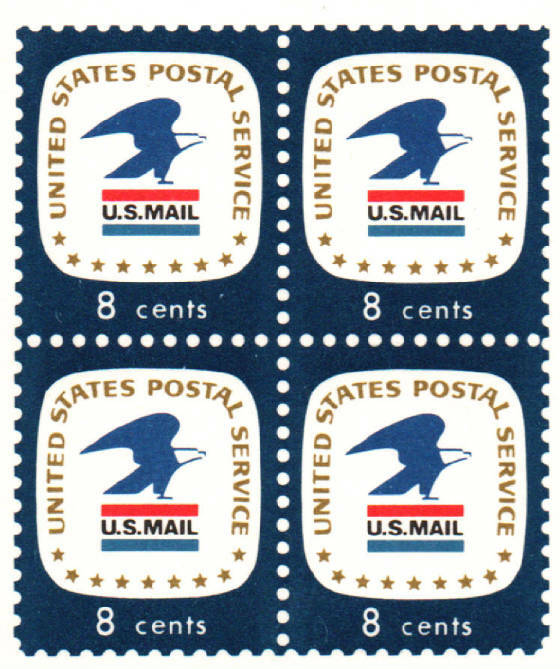 It honors the July 1, 1971 inauguration of the new United States Postal Service. Scott #1396 features the new United States postal Service emblem. 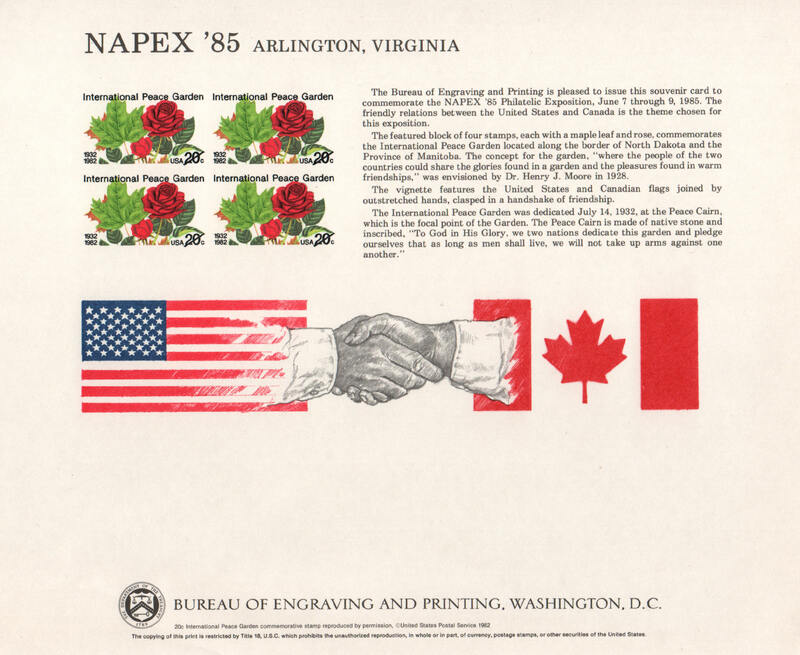 This card was printed by the Bureau of Engraving and Printing for the 1985 National Philatelic Exhibition, NAPEX '85. The Bureau of Engraving and Printing (BEP) NAPEX Souvenir Card was available at the BEP Booth (#13 on the show floor bourse) and sold for $3.00 U.S. 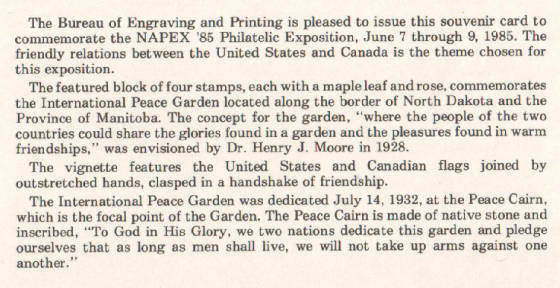 The Bureau souvenir card illustrates the friendly relations between the United States and Canada and depicts a block of four stamps, each with a maple leaf and a rose which commemorates the Internationsl Peace Garden located along the border of North Dakota and the Province of Manitoba, Scott #2014 issued June 30, 1962. Also illustrated are the United states and Canafian flags joined by outstretched hands clasped in a handshake of frienship. Bureau cards are very popular with some, now scarce, commanding hefty prices. 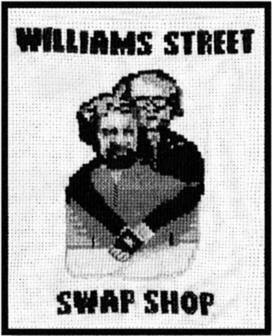 These are the only official producers of what are now known as nonpostal, highly collectible, cardboard souvenirs of stamps and stamp collecting. Some are quite rare and valuable. 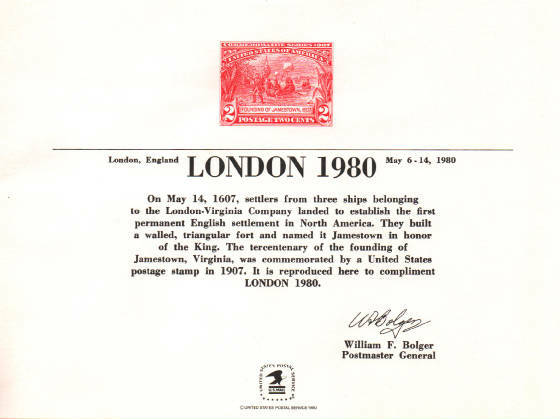 This fine card was printed by the United States Postal Service for the 1980 London International Stamp Exhibition. 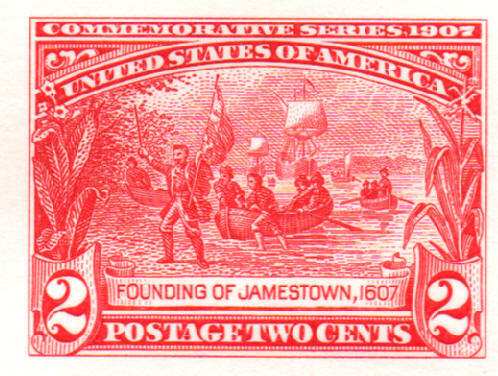 Closeup of the Jamestown Exposition Issue of 1907, The Founding of Jamestown, Scott #329. The Jamestown Exposition was held in the United States from April 26th through December 1st, 1907 in Hampton Roads, Virginia. I'll have more souvenir cards from my collection to share with you over the next few days. 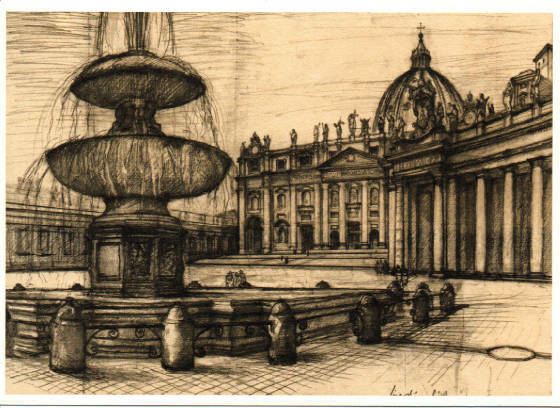 Fontana di piazza San Pietro, the Fountain of Saint Peter, St. Peter's Square with a view of the Basilica in the background, is the sixth and final postcard of six representing the views of architecture and fountains from original designs of Lino Bianchi Barriviera issued in a celebratory stamp series of the European architectural heritage year, March 3, 1977 in Vatican City. 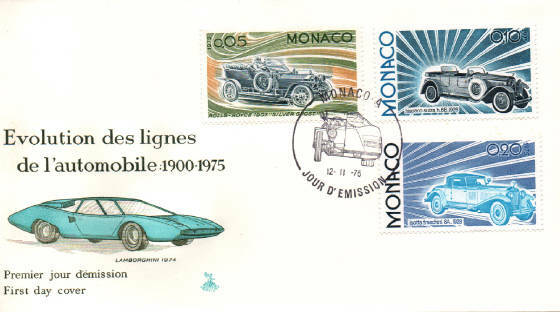 The first day of issue circular date stamp cancellation and description. The envelope from Vatican City containing all six souvenir first day of issue Barriviera cards. I've enjoyed posting this collection for you. Fontana di piazza San Marta, abside di San Pietro e chiesa di San Stefano degli Abissini, the Fountain of Saint Martha, Saint Peter's apse and Church of San Stefano Abissini, is the fifth postcard of six representing the views of architecture and fountains from original designs of Lino Bianchi Barriviera issued in a celebratory stamp series of the European architectural heritage year, March 3, 1977 in Vatican City. 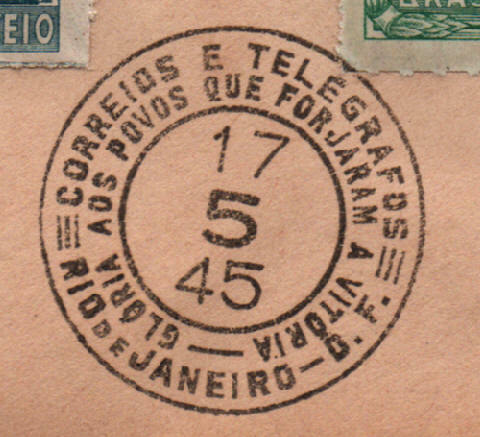 The first day of issue circular date stamp. 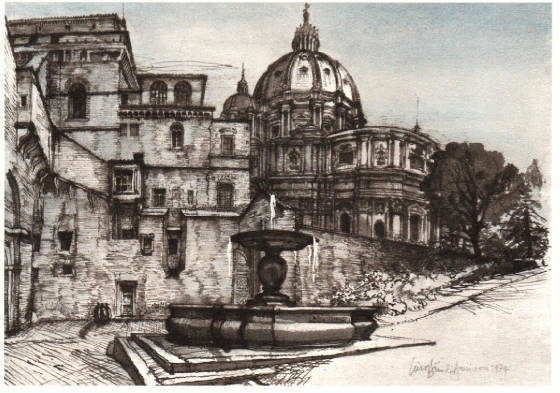 Next, Fontana di Piazza San Pietro,the fountainof Saint Peter's Square. 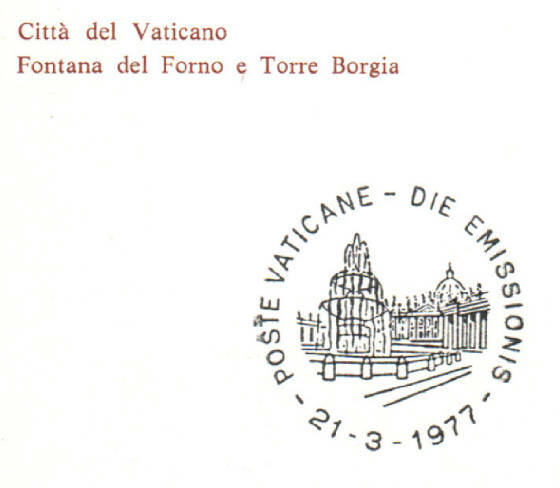 Fontana del Forneo e Torreo Borgia, the fountain of the kiln and Borgia Tower, is the fourth postcard of six representing the views of architecture and fountains from original designs of Lino Bianchi Barriviera issued in a celebratory stamp series of the European architectural heritage year, March 3, 1977 in Vatican City. The first day of issue Vatican City circular date stamp and description. 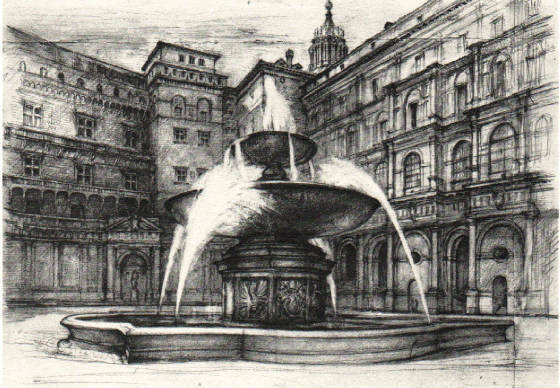 Next we'll look at Fontana di piazza San Marta. Fontana E Cortile Del Belvedere, the fountain and courtyard of the Belvedere, is my next entry for the postcards representing the fountains of Vatican City. 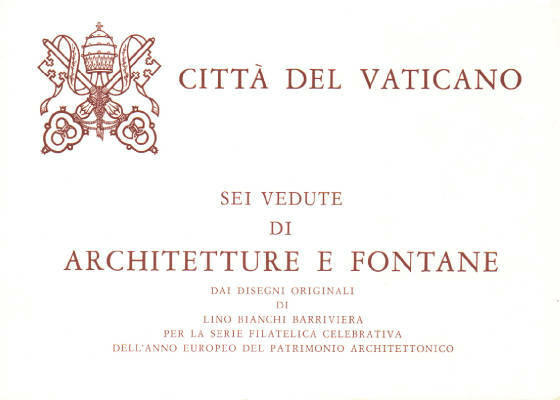 This is the third postcard of six representing the views of architecture and fountains from original designs of Lino Bianchi Barriviera issued in a celebratory stamp series of the European architectural heritage year, March 3, 1977 in Vatican City. The reverse of the first day of issue postcard, circular date stamps and printers' details. 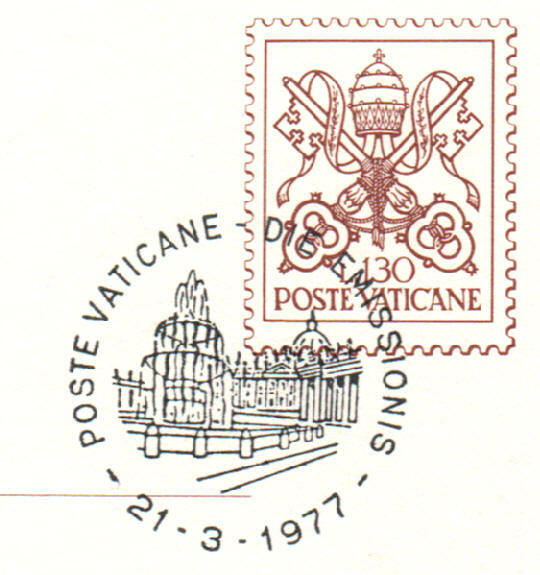 Closeup of the circular date stamp tied to the printed Vatican stamp illustrating the papal arms. 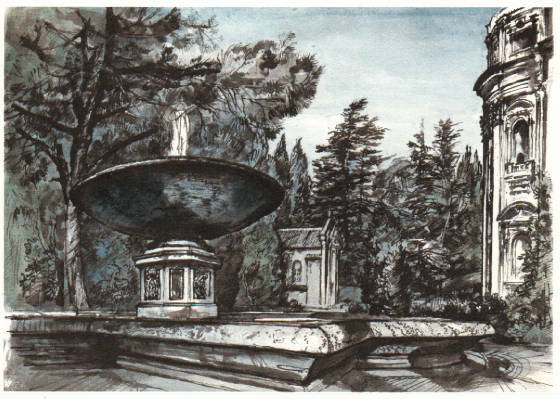 Next we'll look at Fontana del Forno e Torre Borgia, the Fountain of the Kiln and Borgia Tower. The second postcard of six views of architecture and fountains from original designs of Lino Bianchi Barriviera was issued in a celebratory stamp series of the European architectural heritage year, March 3, 1977 in Vatican City. The Casino of Pius IV, also known as Casina or Villa Pia, is a building which stands inside the Vatican gardens Vatican City State. It is seat of the Pontifical Academy of Sciences and of the Pontifical Academy of social sciences. The little house was built in 1558 by Pope Paul IV, designed by Pirro Ligorio assisted by Giovanni Sallustio Peruzzi (son of the more famous Balthasar). On the death of the Pontiff, the building was completed in 1561 under Pius IV, who turned it into a recreation and entertainment. 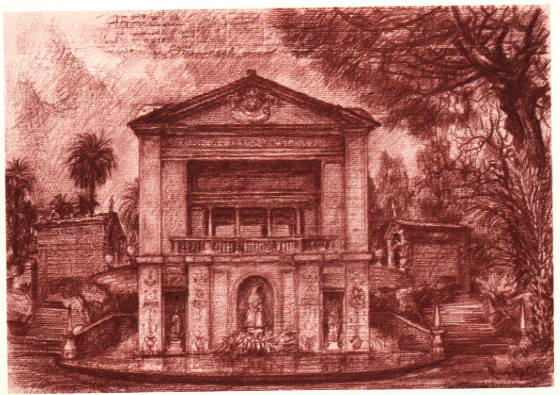 For this, the architect had to take account of the many characters of the mansion, which was supposed to reconcile the bucolic aspects of the place to the rigor appropriate to the role of the Pontiff. The result was a building of Mannerist taste extremely decorated with modern and ancient statues, sculptures and paintings. There are two buildings placed before and distinct, the first of which, aimed at the Vatican Palace, is a sort of nymphaeum fronted by a fountain, decorated with ancient mosaics and niches with statues and reliefs, as well as a Doric loggia open at the top. The first day of issue ceremonial circular date stamped cancellation. Next, the Fontana e cortile del Belvedere, the fountain and courtyard of the Belvedere. Six views of architecture and fountains from original designs of Lino Bianchi Barriviera were issued in a celebratory stamp series of the European architectural heritage year, March 3, 1977 in Vatican City. The Fontana della Galea is located inside Vatican City near the gardens of the Vatican Palace. This "decoration" was planned by garden designer-architect Giovanni Vasanzio in 1620. It is considered by many to be the most beautifull fountain in Vatican City. 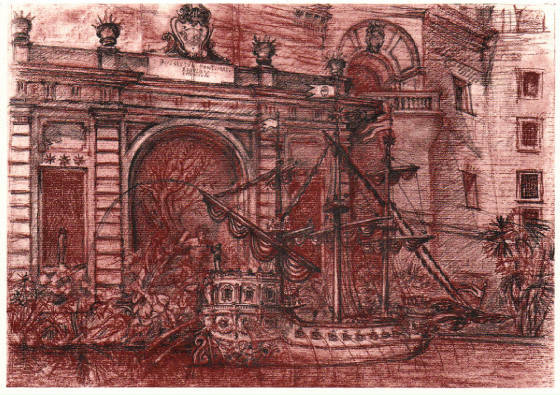 Here is the first of the series, The Fontana della Galea. The ceremonial first day of issue circular date stamp. 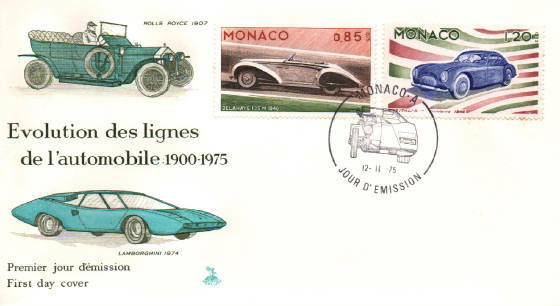 I have the entire set of six postcards and I'll share them with you within my blog over the next few days. 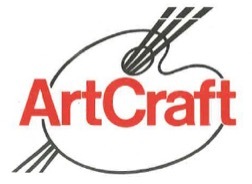 ArtCraft was a great company. 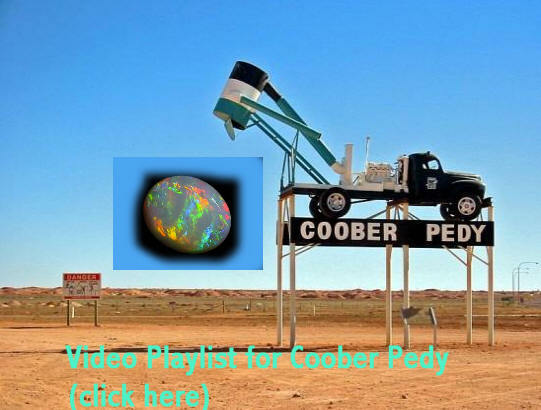 Perhaps the greatest cachet maker the world has ever known. 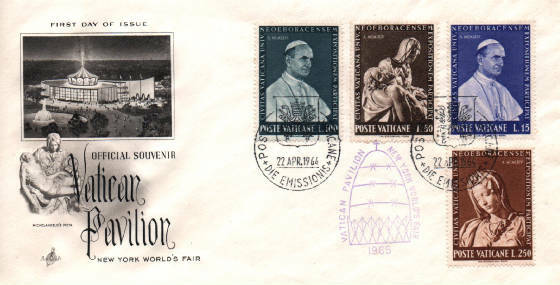 Proof of that fact is this beautifully illustrated souvenir cachet of the Vatican Pavilion issued at the New York World's Fair on April 19, 1964, opening day. 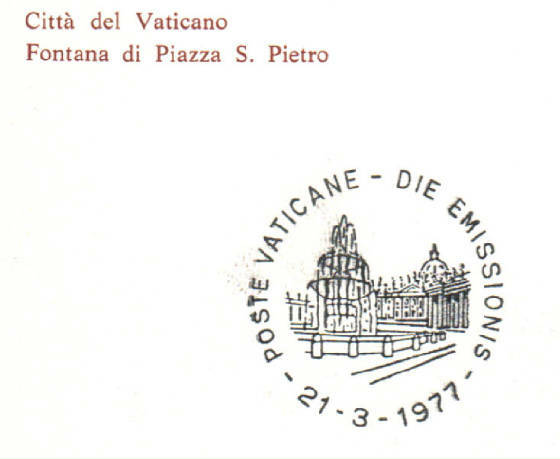 The cachet illustrating Michelangelo's masterpiece ,The Pieta and the Vatican Pavilion. Four stamps were issued by Vatican City postal authorities that same day, Scott #'s383, 384, 385 and 386. 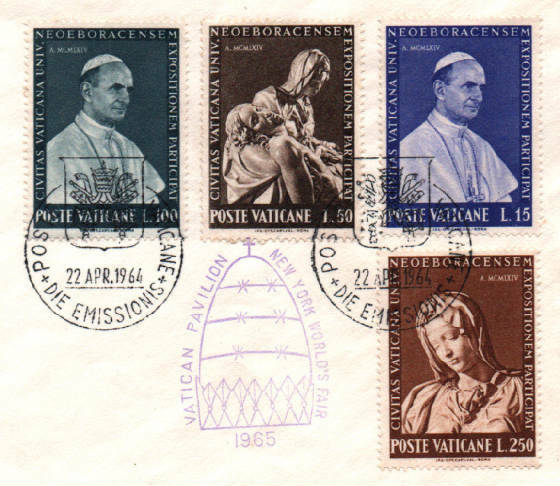 On cover are (left to right) #385 Pope Paul VI, #384 The Pieta by Michelangelo, #383 Pope Paul VI, and #386 head of Mary from The Pieta. 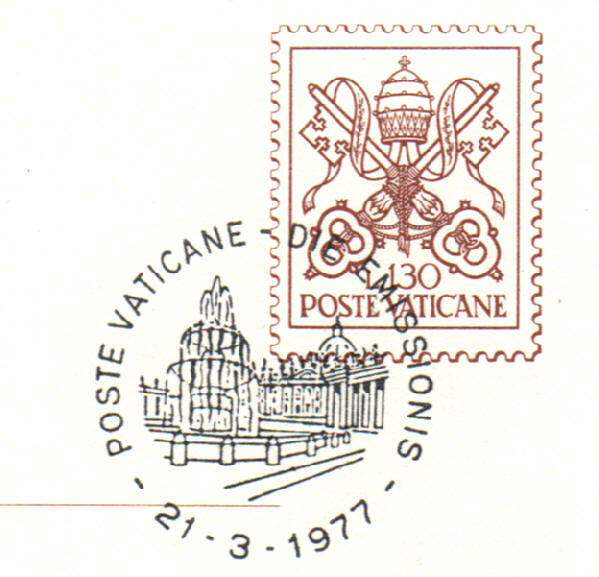 The stamps are tied to the cover by the official Vatican City circular date stamps and the official souvenir violet handstamp of the Vatican Pavilion between the circular date cancels. The most important work of art at the Fair was Michelangelo's 465 year old (in 1964) masterpiece The Pieta. The Pieta represents the body of Christ resting in the arms of His mother moments after he was taken from the cross. 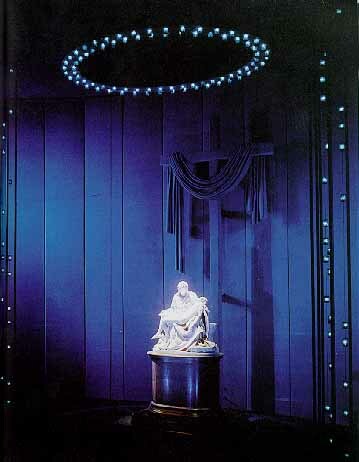 The Pieta is six feet long by five feet nine inches high, marble, and was displayed within a background created by stage designer Jo Mielziner. Pavilion visitors moved past it on three platforms at different levels. A walkway was also provided for visitors wishing to view it. The Pieta had never left the Vatican prior to the World's Fair. 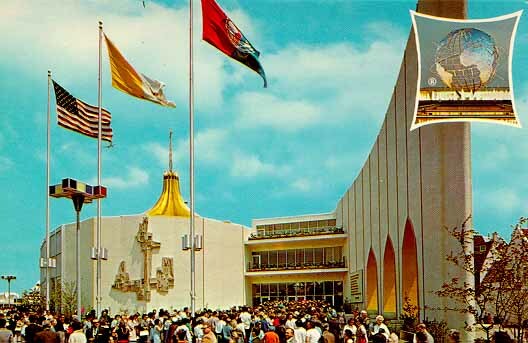 This is an actual photograph of the Vatican Pavilion at the New York World's Fair 1964. 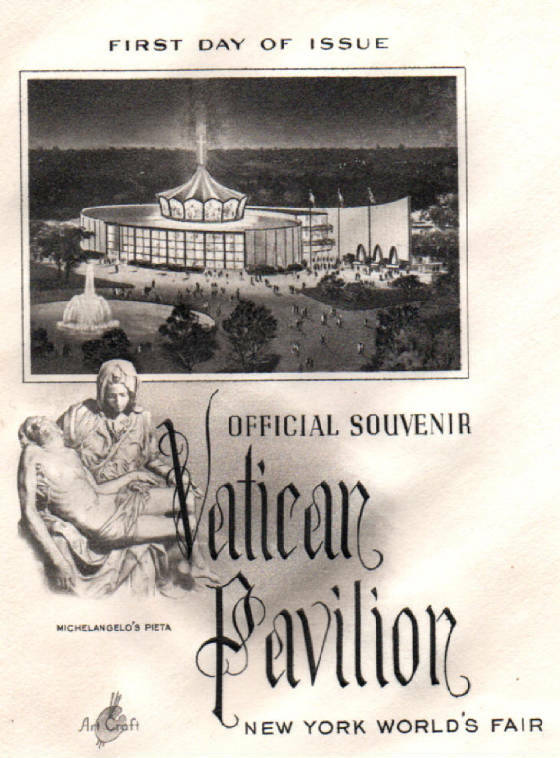 The Vatican pavilion was oval shaped. The cross adorned the top of the structure. The wall of the pavilion extended from the entrance. The pavilion's theme was, "The Church is Christ Living in the World." I'm proud to have this first day cover in my collection. 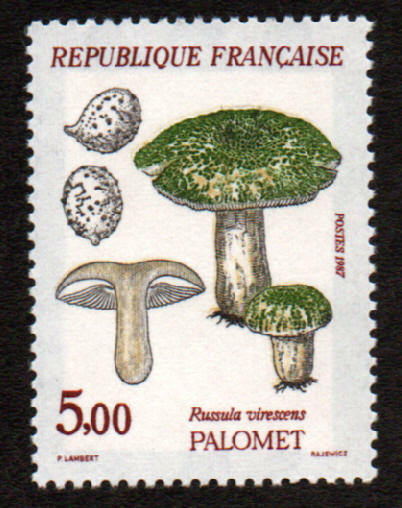 The Quilted Green Russula is a highly prized mushroom. Popular in Spain and China, the Russula is edible and a favorite of every mycophagist. 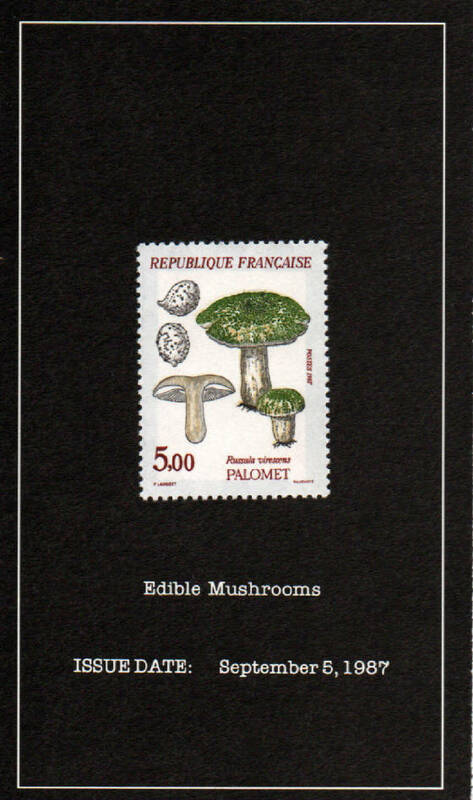 This epicurean delight merited it's own stamp and souvenir card issued September 5, 1987, France Scott #2053. A closer look at Russula. 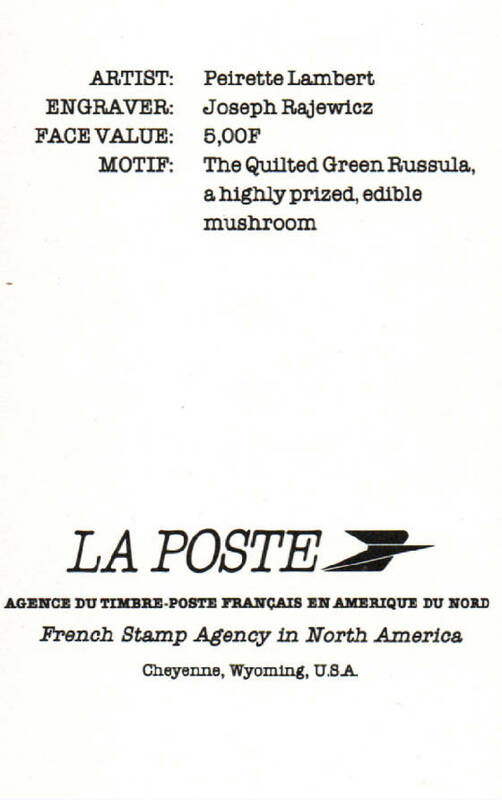 And the description on the reverse of the souvenir card distributed by the French Stamp Agency in North America. I know I'd enjoy a marinated Russula Virescens sandwich on Texas toast. 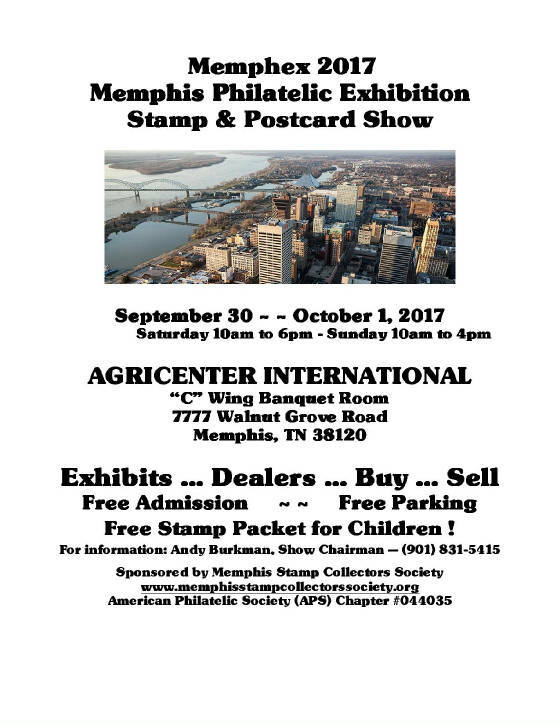 Click the newspaper and link to the Memphis Stamp Collectors Society web pages for great links, information and details about MEMPHEX 2017, the Memphis Philatelic Exposition held September 30th and October 1st at the Agricenter International in Memphis, Tennessee. 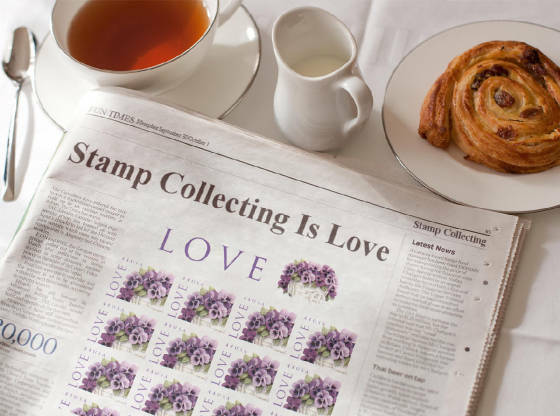 Discover what stamp collecting can do for your heart. Sweden (Sverige), the Kingdom of Sweden, is a Scandinavian country in Northern Europe. Sweden borders Norway to the west and north and Finland to the east, and is connected to Denmark in the southwest by a bridge-tunnel across the Öresund. 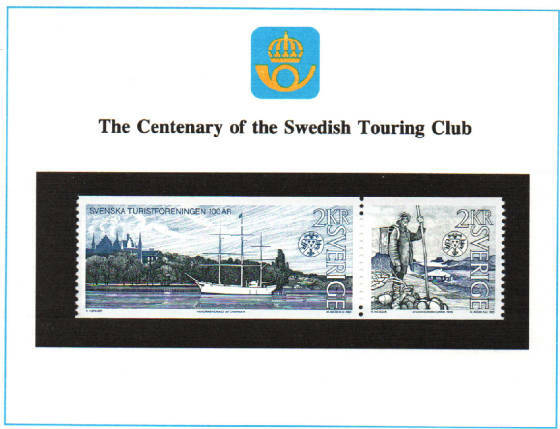 Sweden is the third-largest country in the European Union by area and issued its first postage stamps on July 1,1855. 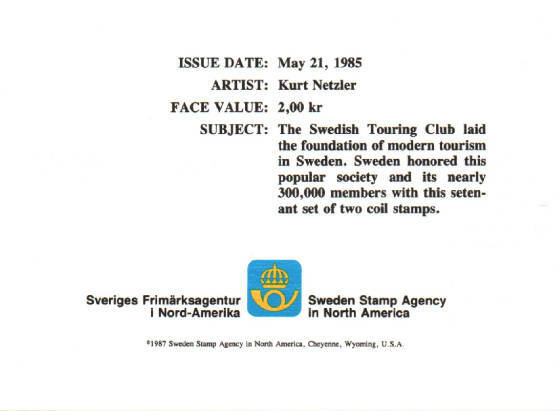 On May 21, 1985 the Sweden Stamp Agency issued a se-tenant coil stamp honoring the Swedish Touring Club. This is the se-tenant coil attached to the first day of issue souvenir card, Scott #1545a. Scott #1544, the Touring Club at Syl Station and Scott#1545 the schooner at Chapman Hostel in Stockholm. The ceremonial inscription on the back. Check around the web and see if you can locate one of these Swedish se-tenant commemoratives. Let me know how easy it was for you to find one. Laos is a beautiful country in the heart of the Indochinese peninsula of Mainland Southeast Asia, bordered by Myanmar (Burma) and China to the northwest, Vietnam to the east, Cambodia to the southwest, and Thailand to the west and southwest. 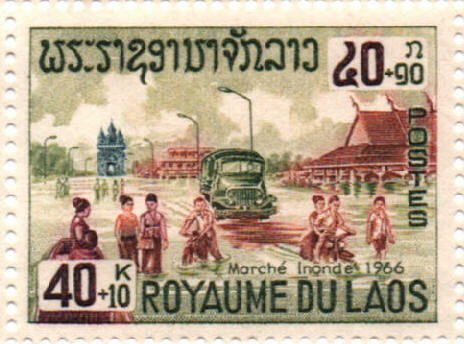 The English word Laos was coined by the French, who joined three Lao kingdoms in French Indochina in 1893, and named the country as the plural of the Lao people. A mountainous landlocked communist state in southeastern Asia, Laos achieved independence from France in 1949. A laotian is a member of a Buddhist people inhabiting the area of the Mekong River in Laos and Thailand and speaking the Lao language. They are related to the Thais. Laotian is the Tai language of the Buddhist people living in the area of the Mekong River in Thailand and Laos. 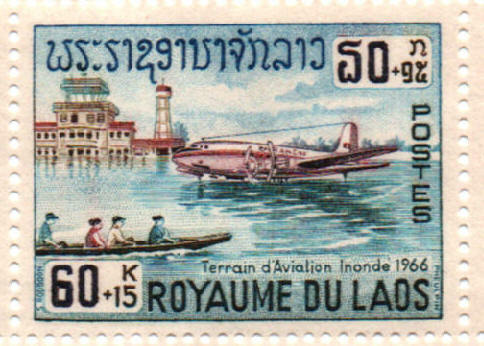 On January 18, 1967, the Laotian postal authority issued three semi-postal stamps to raise money for the victims of a terrible Mekong Delta flood. 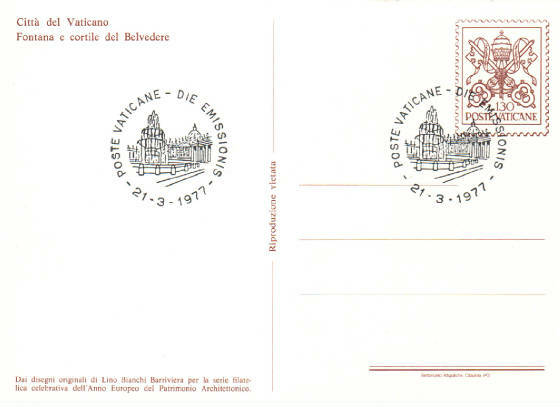 Semipostal stamps are sold with a surcharge over the postal value. 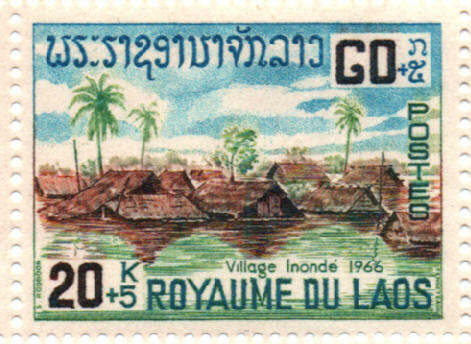 The additional charge is always for a special purpose, in this case to help the flood victims of the Mekong, and is usually recognized by the presence of two (often different) values, separated by a "+" sign, on a single stamp. 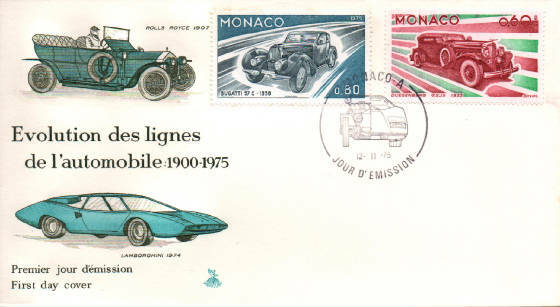 Scott #'s B6, B7 and B8 are represented on this beautifully illustrated 50 year old semipostal sheet issued to help this very worthy cause. B6 is the tragic image of a flooded village. B7 is the sad image of a flooded market place and a truck in the water. B8 is the distressing image of a flooded airport and plane.. The entire semipostal sheet, printed in Paris, is assigned Laos Scott Catalog #B8a. 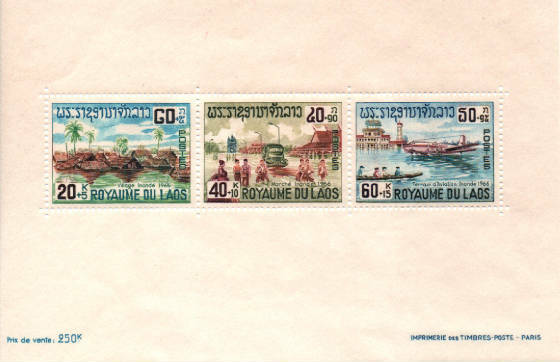 The first stamps of Laos were issued on November 13, 1951. 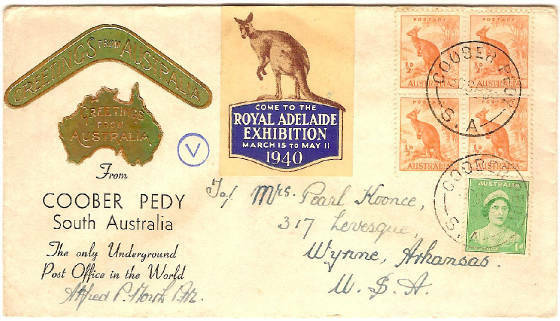 Before then the stamps of French Indo-China were used. 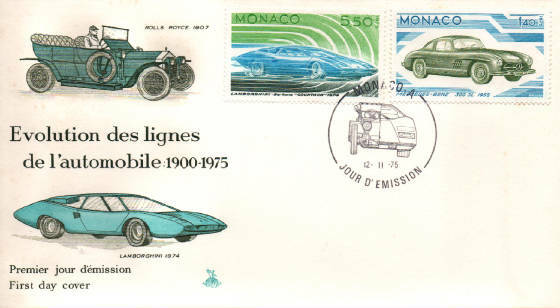 Part of my collection, this semipostal sheet is scarce today. 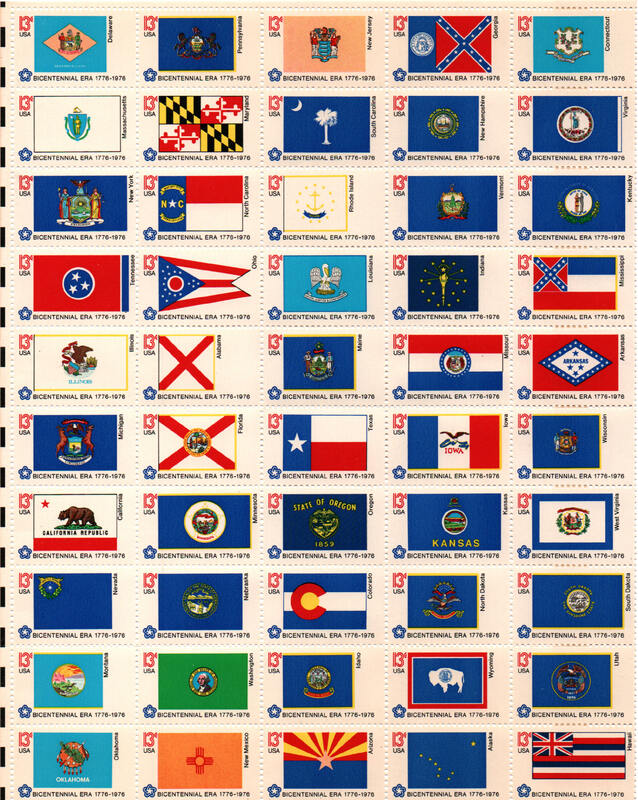 A pane of stamps depicting the flag of each of the Union's fifty states was issued on February 23, 1976. 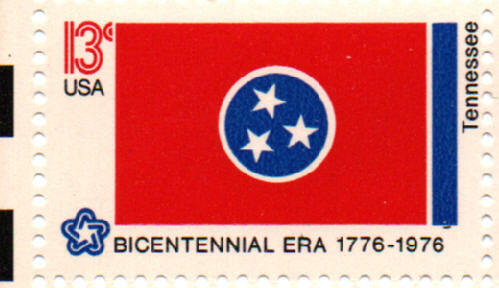 They were issued for the American Bicentennial. All of America's states are represented on the sheet. Scott #'s 1633 through 1682. The state flags are represented horizontally on the pane in the order in which they entered the Union. 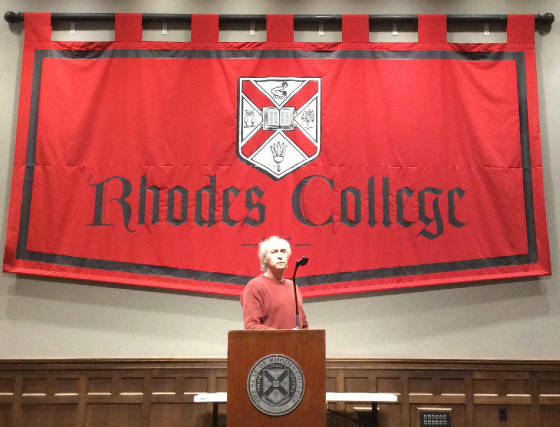 Tennessee, the 16th state, is Scott #1648. Beginning with the flag of Delaware (the Union's first state) in the pane's upper left corner, the stamps proceeed to Hawaii (the Union's last state) in the lower right corner. 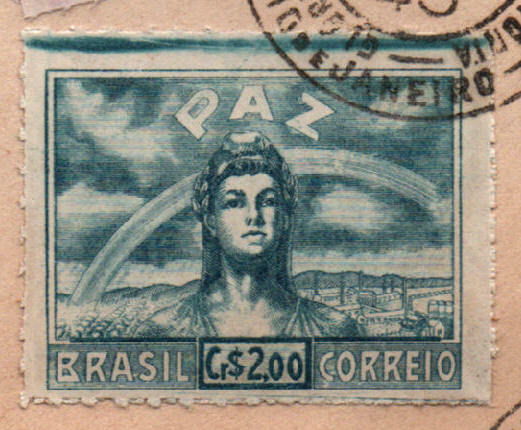 This was the first pane ever issued with fifty different stamps. The mint sheet, which sold for $6.50 in 1976, catalogs for $17.50 in the 2014 Scott Catalog.